We just got back from a road trip from Texas to the midwest. 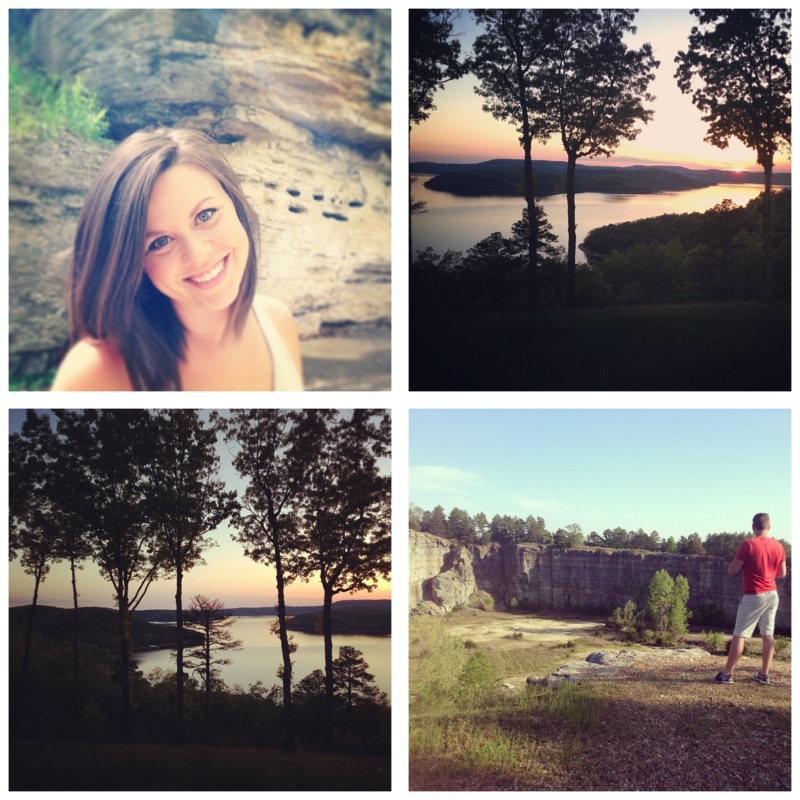 We stopped in Eureka Springs (Arkansas) to celebrate our first anniversary. We had a great time hiking, canoeing, and relaxing. Click on any set of photos to enlarge! 1. The multi-level historic district in Eureka Springs. The road splits here into the upper and lower levels of shopping and dining. There are so many steep streets in downtown Eureka Springs! 2. Stairs connecting the multi-level streets in the shopping district. Handsome husband. 3. Fudge! There were a lot of little fudge shops in the area. We came away with a chocolate assortment along with vanilla pecan fudge! 4. 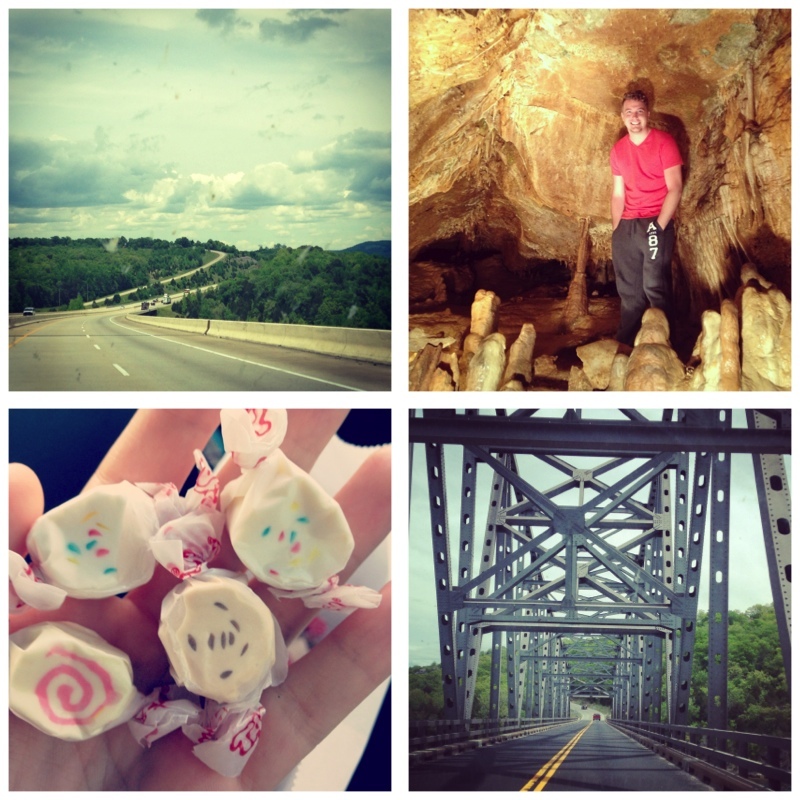 There were hiking trails all around Eureka Springs. This was right before sunset, the sun was shining so perfectly between the trees. 5. 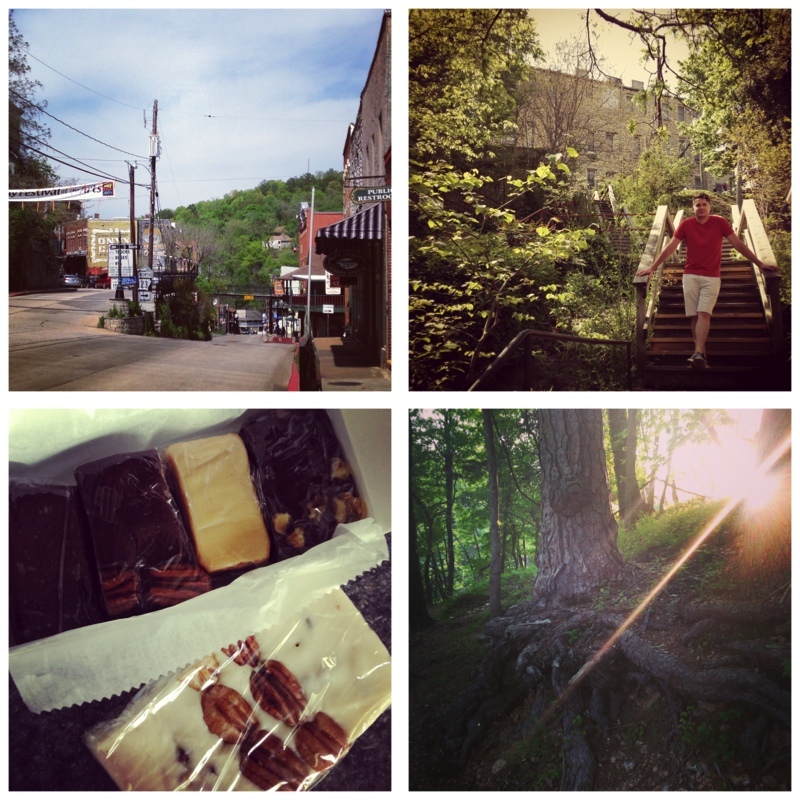 Hiking on a trail that overlooked the historic district of Eureka Springs. 6. & 7. We pulled over on a winding road to capture this perfect view and enjoy the sun setting over the lake. 8. We hiked up a trail near the lake took us to this overlook point. It’s hard to tell from this picture, but we were on the edge of a cliff that dropped straight down into this canyon. 9. So many curving roads and forested hills in Arkansas. 10. Taking a tour of Cosmic Caverns. Family owned and maintained, it wasn’t the most conventional tourist spot, with narrow walkways and tight openings, but it was a lot of fun! 11. Saltwater taffy, one of my favorites! We stopped at a candy factory along the way. They had so many flavors, including cupcake, chocolate chip cookie, and strawberry cheesecake. 12. A bridge along the way, leaving Arkansas. 13. We stopped in St. Louis for dinner at Bailey’s Range. We loved the feel of the place, and their fresh burgers and homemade milkshakes! 14. The arch! I grew up near St. Louis and have many childhood memories of visiting this place. 15. 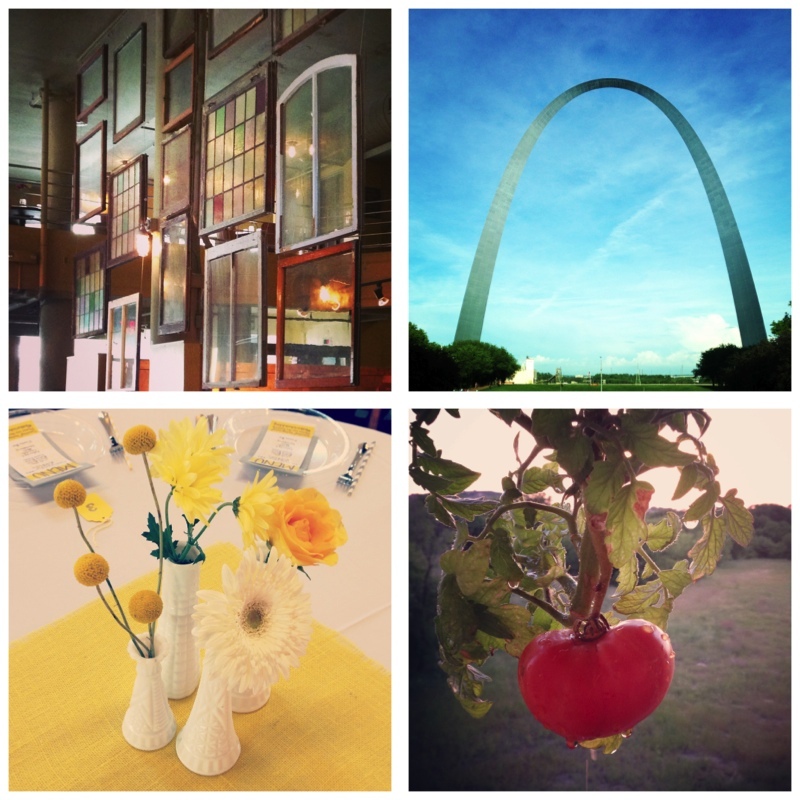 Our road trip ended in Southern Illinois for a family wedding. Loving the billy balls in the table centerpieces! 16. We arrived home to find that my first tomato had turned red. Several cold snaps have stunted its growth, it’s literally started growing months ago. Pretty excited that it’s ready! We had such a fun time road-tripping but it’s so good to be back home in Texas! Road trips are the best! And it looks like you guys had an amazing one, such a fun way to celebrate your first anniversary! Wow, what a great time! I love it when hubby and I hit the road. So much fun :) Thanks for letting us ride along!